Torres Strait Islanders are from the Torres Strait Islands region. Some Torres Strait Islander peoples have moved to mainland Australia either through forced removal or for employment and education. Over time, the following definition has been agreed within the community and Australian Government to identify when someone is an Aboriginal person. Is accepted as a Torres Strait Islander person by the community in which he or she lives. There are approximately 270 islands in the Torres Strait, remnants of the Sahul Shelf, a now submerged land-bridge that linked the Australian mainland and Papua New Guinea between 80,000 and 9,000 years ago.37 Torres Strait Islanders live permanently in 20 communities on 17 of the islands, as well as in locations in every Australian state. Two communities, Seisia and Bamaga, sit on the Queensland coast as part of the Northern Peninsula Area (NPA). Torres Strait Islander culture has a unique identity and associated territorial claim, although their culture and people are often conflated with Aboriginal people. Torres Strait Islanders are not mainland Aboriginal people who inhabit the Torres Strait. The Torres Strait Regional Authority notes that the traditional people of Torres Strait are of Melanesian origin and speak two distinct languages. In the Eastern Islands (Erub, Mer and Ugar) the traditional language is Meriam Mir, while the Western and Central Island groups speak either Kala Lagaw Ya or Kala Kawa Ya, which are dialects of the same language. Another widely used language is referred to as Torres Strait Kriol. 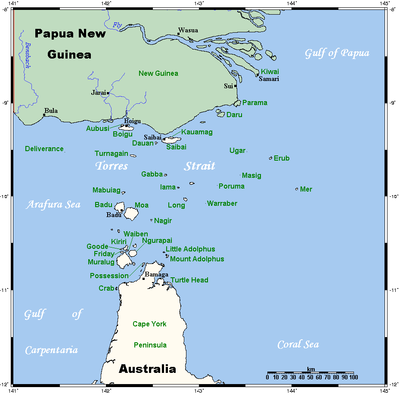 Torres Strait English, a regional version of Standard Australian English, is also spoken by Islanders in the Strait and on mainland Australia. The array of languages and their variants means that many Islanders are multilingual and, while Standard English may be included in this repertoire, it is advisable to assess the extent to which it is understood and practised if that is to be the language of choice in any working relationship. In the 2011 Census, 52 616 people identified as being of Torres Strait Islander origin (including people identified as being both Torres Strait Islander and Aboriginal origin), were counted in the Census. Of these, almost two-thirds (63%) lived in Queensland and 15% in NSW and 6% in Victoria. The Torres Strait Islands are part of the Australian state of Queensland. Situated between mainland Australia and Papua New Guinea, the Torres Strait Islands are the only part of Australia sharing a border with another country. The Torres Strait Islands are part of the Australian state of Queensland. The administrative centre for the territory is based on Thursday Island where are regrouped 15 Queensland Government and 14 Commonwealth Government Departments. At the local level, each island community elects its own council which meets monthly to run the domestic affairs of the island. These councils have very wide powers. Councillors are elected for a three year term. The chairperson of each council is a member of the Island Coordinating Council which meets to discuss regional issues. In 1994, in response to local demands for greater autonomy, the Torres Strait Regional Authority (TSRA) was established to allow Torres Strait islanders to manage their own affairs according to their own ailan kastom (island custom) and to develop a stronger economic base for the region. The TSRA is made up of 20 representatives elected by Torres Strait Islanders living in the islands. The Torres Strait Islands Treaty signed by Australia and Papua New Guinea allows for free movement (without passports or visas) between Australia and Papua New Guinea for traditional activities in a limited zone of the Torres Strait. The first inhabitants of the Torres Strait are believed to have migrated from the Indonesian archipelago 70,000 years ago at a time when New Guinea was still attached to the Australian continent. They were followed by new waves of migration. The original inhabitants lived in small communities relying on fishing, hunting and the growing of crops for their subsistence. Trade in artifacts made of pearl shell, turtle shell, feathers, canoes and tools was very important in the life of Torres Strait Islanders. Although it is likely that Chinese, Malay and Indonesian traders had explored the islands before him, the first navigator credited with coming across the islands is the Spaniard Luis Vaez de Torres who sailed through the strait in 1606. The discovery of pearl shell in the 1860s led to an influx of people from all over the region (Japanese, Malays, Filipinos, Micronesians and Europeans) especially on Thursday Island (Wyben) which became the main settlement. By 1877, 16 firms were established on Thursday Island employing 700 people and more than a hundred pearl luggers. Although the pearl trade stopped after World War II, cultured pearl farms still operate in the Torres Strait today. Queensland officially annexed the islands in 1879. The Torres Strait islanders became citizens of Queensland in 1967 with full access to health and social services and freedom to travel and work in Australia. Many thousands of Islanders live in Queensland today, where they form a strong community. In June 1992, the High Court of Australia recognised the native title rights of Eddie Mabo, an inhabitant of Murray Island (Mer), over his traditional land. The High Court overturned the previous concept of terra nullius which stated that in legal terms Australia was empty of inhabitants when it was first settled by Europeans. Since the Mabo decision, several communities (Saibai Islanders and Mualgal people from Moa Island) have secured legal recognition of their native title rights over their islands. Several other cases are also in progress.